LUSAKA (Reuters) – Zambia President Rupiah Banda will seek re-election in 2011, renewing his fierce rivalry with main opposition leader Michael Sata who narrowly lost a disputed vote last year. Banda, who had indicated in 2008 that his mission was only to complete economic programmes started by his predecessor Levy Mwanawasa in Africa’s biggest copper producer, said he would heed calls by ruling party supporters urging him to contest the 2011 vote. 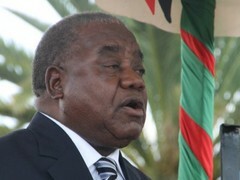 Banda’s announcement came a week after Sata announced he would challenge for the presidency in 2011. Both will be 74 at the time of the 2011 election. “I am not blind to your message that you will support me in 2010 at the (party) convention and my adoption as presidential candidate in 2011,” Banda told ruling party supporters and journalists late on Tuesday in Livingstone, 500 km (310 miles) south of the capital. “If I am well and healthy, and if you feel I merit your adoption, I will be ready to be adopted,” Banda said. It was the first time that Banda had publicly stated his intention to stand again for president. Ruling Movement for Multiparty Democracy (MMD) spokesman Benny Tetamashimba reinforced Banda’s intentions on Wednesday, saying the ruling party would have to adopt Banda to win the 2011 elections. “The MMD has no other candidate for the convention and for the subsequent general elections in 2011. It will be impossible for the MMD to win the elections without President Banda,” Tetamashimba, a close Banda ally and minister of local government and housing, told journalists from state media. Zambia will vote that year in presidential, parliamentary and local government elections. Banda’s predecessor Mwanawasa died last August after a stroke. … is this for real or what? Please advise … thanks a trillion. lets see wer we going! I think the one thing that would redeem these men in my eyes and in the eyes of those who think like me would be if both RB and Sata just humbly stepped down and focussed more on grooming young Zambians to take up positions of power. Shouldn’t that be a role that they’re forced to play as leaders? Power Is Sweet! Let The People Decide. RB is the 8th Wonder of the World!!! I hope PF can organise themselves & come up with a candidate who delegates will elect to stand against RB. Sata is not the answer for me. … your Russian comment has been translated for our audience below as follows: “…Just wonderful – very interesting thoughts”. What happened to the plan to just stay in power in the transition, then step aside? It is time Zambian politicans become true to themselves and the people of Zambia, about their ability to lead effectively, and actually add value to our beloved nation. It is evident that there is a leadership gap right now.